The Seminary Cooperative Bookstores are considering trying to become a nonprofit. HYDE PARK — Sales are up at the Seminary Cooperative Bookstores for the first time in 10 years, but the bookstore still faces major budget shortfalls and is considering a major reorganization to stay alive. At the cooperative’s December annual members meeting, director Jeff Deutsch celebrated the good news, but laid out changes the bookstore will need to consider to make it into the future, including removing voting rights from the majority of shareholders in a bid to reorganize and maintain the forward momentum. 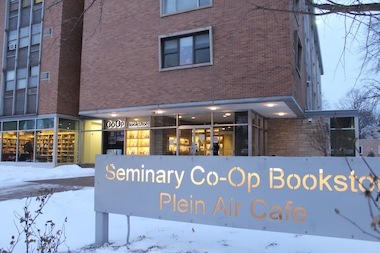 The good news is the 61,395-member cooperative that runs the Seminary Cooperative, 5751 S. Woodlawn Ave., and 57th Street Books, 1301 E. 57th St. is seeing sales rise for the first time in more than a decade. “A big part of it is the community coming together and recognizing the importance of the store,” Deutsch said. Overall sales were up by more than 5 percent for the 2015-16 fiscal year compared to the prior year. That means an extra $144,000 coming in the door, a sizable chunk for the cooperative that was running a $300,000 deficit in 2014 when Deutsch took over as director. Deutsch said the store is doing better while other bookstores continue to suffer because it nearly doubled the number of events it hosted to 348 compared to 188 in the prior year. He said it’s also because the bookstore started experimenting with selling used textbooks and focused more on selling kids books at 57th Street. Still, those improvements are not enough to close the revenue shortfall and the cooperative ended the year with a $205,136 operating deficit. “It’s a significant number,” Deutsch said. “We’ve been making it work by the generosity of members" and the University of Chicago. Deutsch has started to make the case to the board that the cooperative’s thousands of shareholders are holding it back in some ways. He said he thinks the bookstore should change its articles of incorporation and try to become a nonprofit. He said such a move would require approval by two-thirds of the shareholders, not an easy task when only about 60 of the 61,395 shareholders show up for meetings. “We could have a million shareholders or 100, the important thing is they show up and are engaged,” Deutsch said. The new system being proposed would change shareholders who don’t say they want to keep their voting rights to “charter members,” who would retain all the discounts they currently get, but wouldn’t be allowed to vote at meetings and would not be eligible for dividend payments if the cooperative again became profitable. New people would be encouraged to become “members” and would be eligible for discounts, but have no official role in the governance of the cooperative. Deutsch said the details are still being worked out and could include dissolving the cooperative, which was incorporated in the 1960s in Washington, D.C., before Illinois had robust cooperative laws, and reforming it in Illinois.